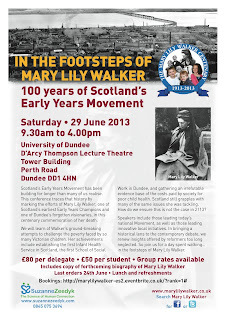 Conference NewsIt's two weeks today until our conference Mary Lily Walker’s Footsteps: 100 years of Scotland’s Early Years Movement gets underway at the University of Dundee. 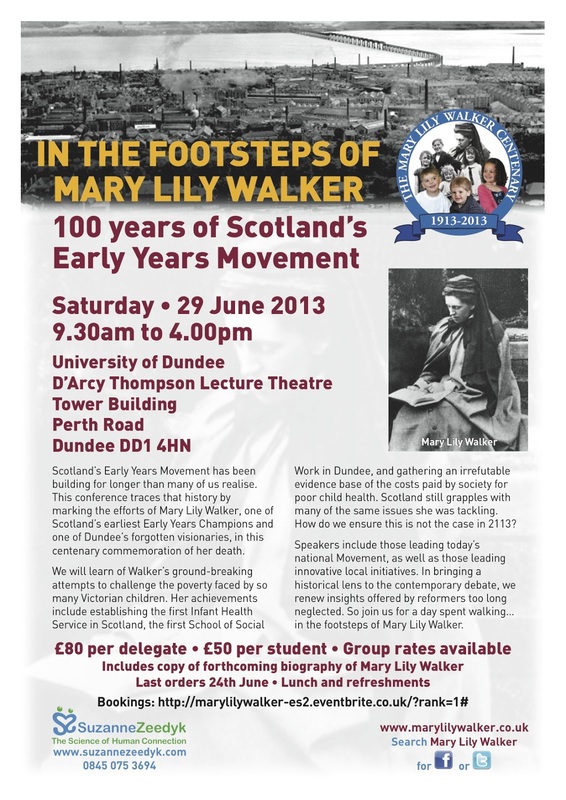 Places are still available via Eventbrite (link below) at a price of £50 for students and £80 for other delegates. The event goes on throughout the day from 9am to 4pm, with welcome coffee, mid-morning tea and lunch for all delegates. There'll be a variety of speakers from all across Scotland and beyond, including representatives from the Scottish Parliament, University of Dundee and Glasgow's Violence Reduction Unit. 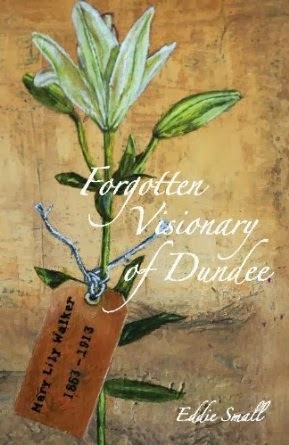 We're also pleased to announce that there will be a free copy of local author Eddie Small's new book Mary Lily Walker: Forgotten Visionary of Dundee available for all conference delegates. It's been a busy time for Mary Lily Walker recently, and the local newspapers have been kind enough to feature her not once, but twice. 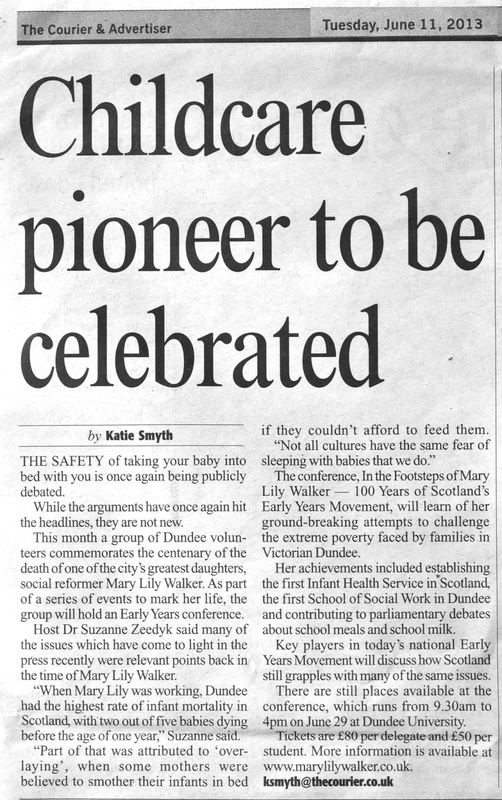 On Tuesday last week, The Courier in Dundee talked about the parallels between the current debate on sleeping alongside one's baby with the issues that Mary Lily Walker discussed back in her day over 100 years ago. 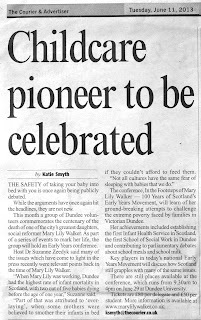 Before this, the Courier featured an article about the delightful Edwardian banquet we held in St Paul's schoolrooms earlier this month. You can read the articles over at our Facebook page, Here and Here. 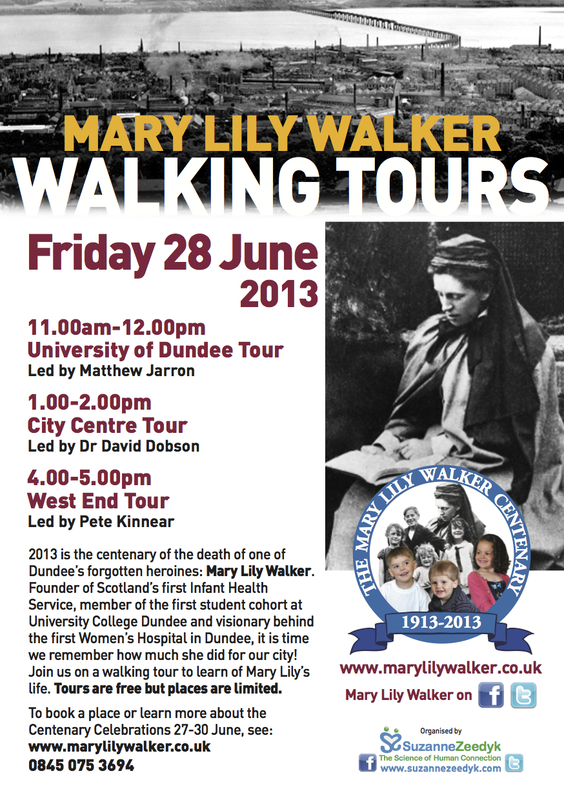 A big thanks to all who attended our walking tours on Wednesday 12th of this month. 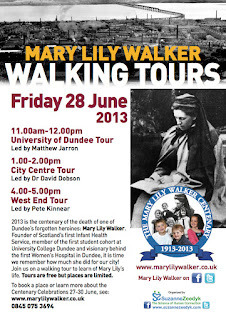 We've had some excellent feedback from our walkees, and we're looking forward to showing more of you the hidden sites of early 20th century Dundee in the coming weeks. There's more tours planned for the 28th June, and some on today (15th June) if you're quick enough to grab yourself a place. "I am sure that I never heard her name before, given all the things she did why haven't we ever heard her name before? "She must have been a most remarkable woman"
"This has been most interesting and we look forward to reading more about Mary Lily"